I recently took part in a cigar and red wine matching exercise with Alvaro Marcos Garcia of Concha y Tora and two lovely fellows, Jimmy and Dan, from Hunters & Frankau, a major cigar importer and distributor here in the UK. Alvaro is an ex-sommelier and he often noticed that diners would often have a cigar after lunch or dinner with the last of their red wine. When one thinks of cigars, it’s usually port or brandy that springs to mind as an accompaniment. 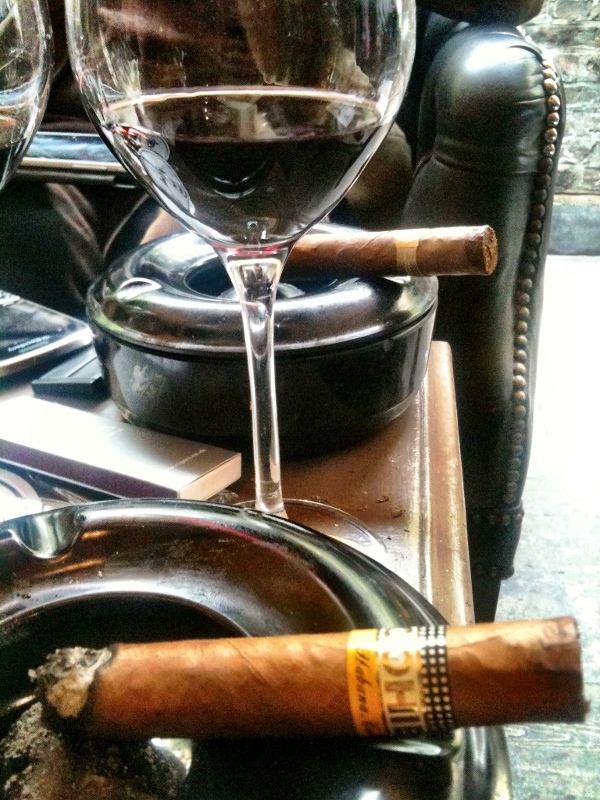 However, even though cigar and red wine are not a classic pairing, they are often a common pairing. 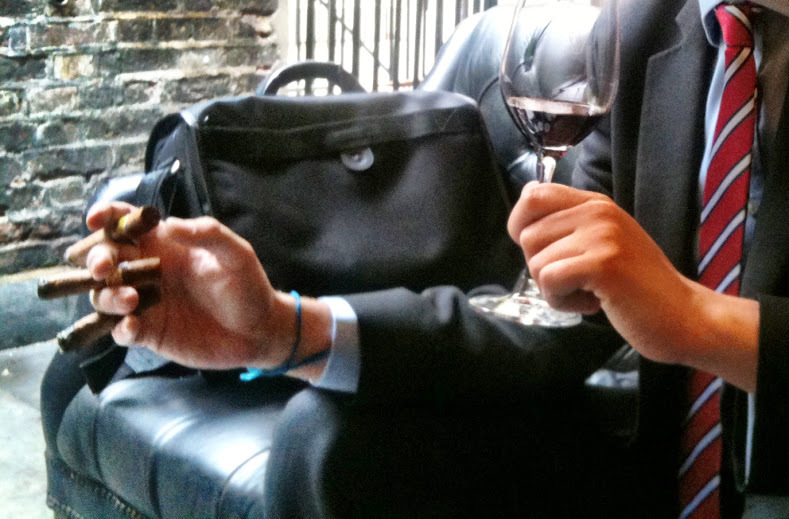 This got Alvaro to thinking and before you know it, we were sitting in the outdoor cigar lounge of Home House in Mayfair, lighting up some stogies as an experiment to see how well they would match with red wine. Alvaro had brought along 3 robust red wines to go along with the cigars that Dan and Jimmy from Hunters & Frankau had brought along. 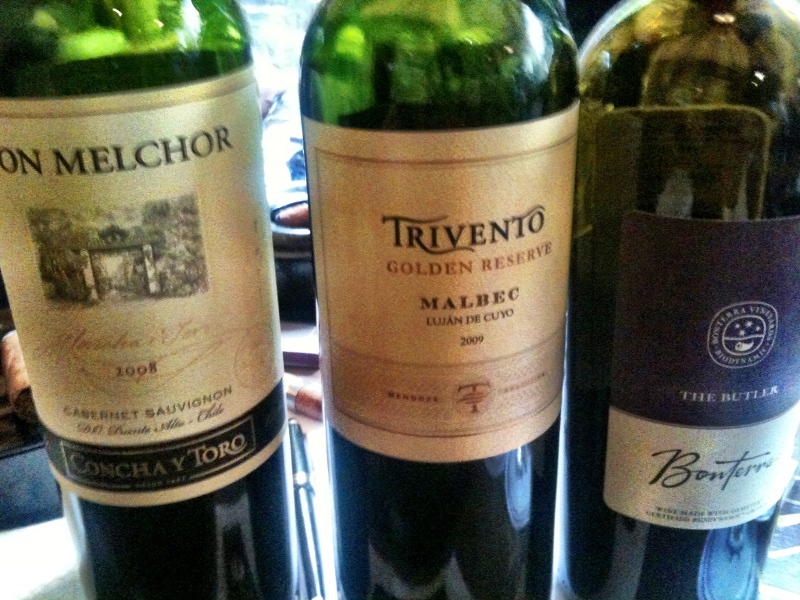 The wines were the Don Melchor 2008, Trivento Golden Reserve Malbec 2009 and Bonterra’s The Butler 2007. All 3 wines were from the New World and I think that for cigars, you do need big and brash wines, wines with fruit and structure because, let’s face it, cigars are not exactly wallflowers of flavour. Briefly on the wines: Don Melchor is a Chilean caberent sauvignon, a rich and complex wine with loads of fruit flavours. The Trivento is 100% malbec, a silky wine with loads of cherry and plum on the palate. The Butler from biodynamic producer Bonterra, is an enticing syrah/grenache blend with mouvedre and petit syrah also in the blend. A rich and velvety wine, it had licorice, black cherry and a spicy note to it. There is an art to cigar rolling and Jimmy explained that hand rolled cigars are preferable to machine rolled because hand rolled cigars are whole leaves that are rolled in a particular order which allows the flavour to develop from the tip to the very end, it’s like smoking the leaf from the bottom up. That’s why the middle of the cigar is often called the “sweet spot” because that’s where the flavour is most concentrated. The 3 cigars we had to test were the Cohiba Siglo I, Por Larranaga and Bolivar cigars to pair with the wines. These are all very different cigars with the Cohiba being the strongest tasting cigar for me and the Por Larranaga being on the sweeter end of the spectrum. We lit up all three cigars and proceeded to puff, sip, swirl and compare. 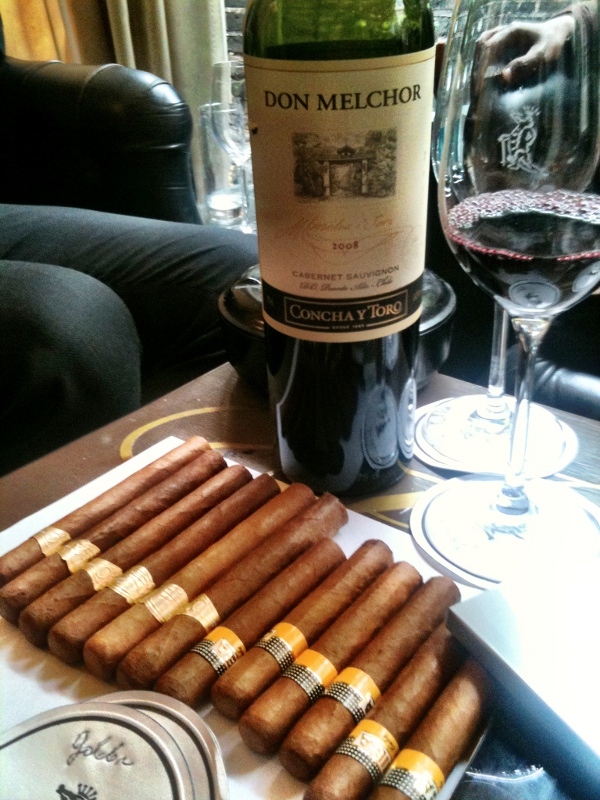 For me, the Don Melchor and the Cohiba were very good companions as the cigar highlighted the spicy notes of the wine. The Por Larranaga because sweeter and very mellow with the Don Melchor but some commented that it was maybe too weak for such big wines. I really liked the Cohiba with the Trivento malbec as the cigar really brought out the fruit of the wine. Another match that I particularly enjoyed was the Bolivar cigar and The Butler syrah/grenache blend, the cigar mellowed out the wine and it was indeed a very enjoyable smoke. The Butler also went well with the Cohiba Siglo I, vanilla flavours along with a softer and fruitier wine were the result of pairing the together. For me, I didn’t particularly enjoy the Por Larranaga with the Malbec as I found flavours of strong tobacco and dark chocolate to much to the forefront but if you like that combination, then that would be just the ticket. All in all, it was an interesting experiment, to see how the wines were affected by the cigars and vice versa. In general, it appears that these big and fruit forward wines pair well with the stronger cigars. I myself really enjoyed the Por Larranaga by itself but the cigar I would probably choose to smoke with a glass of red wine would be the Cohiba Siglo I. Anyone else have any cigar and wine suggestions? I’d love to hear what you all think about the pairing concept. WOW! This experiences sounds really enjoyable. Hand rolled cigars are great. Thank you for sharing! What is the point of having wine and Habanos together? Wine and Habanos?!?$&! *…you must be a parvenu a la F&H! Same as having Caviar and Foie Gras together! A waste of conflicting flavours. I get so annoyed when someone doesn’t read the post, they only read the headline. If you had taken the time to actually read what I wrote, you would have seen that his exercise came about because Alvaro who was a sommelier in London for many years, noticed that his customers often finished their meal with the remainder of the red wine they’d had with dinner. So we sat down to see if it worked. Some worked and some didn’t work at all but that was the point of the entire exercise. It appears that you are unaware that port and cigars are a classic British pairing, more specifically, vintage port, which is usually full of dark fruits with high acidity until they hit the 30 yr mark (and even then some haven’t started to mellow yet) So why wouldn’t New World red wines, esp. From CA and S.America, which are often very fruit forward not match with a Habanero? I wouldn’t match a silky and ethereal red Burgundy to a cigar but as you may have not noticed, we were drinking very robust red wines. Winemakers and educated wine drinkers are open to trying and appreciating different pairings. Winemakers as well embrace this philosophy, I had lunch at Cheval Blanc once where they served an entirely seafood based lunch with their vintage red wines. I feel sorry for you and your limited palate , you will never discover unexpected but delicious pairings, such as fresh orange slices and 10 yr old tawny that I was introduced to by a young Douro winemaker, for example. Happily I have no limitations to my palate and will continue to experience different wine pairings, whether it’s with food, cigars, music or art, that’s the beauty of wine, the endless possibilities. Did you not find that the cigars after a while nullified any flavours from the wine somewhat? I know cigarettes can be a little taste numbing at times so I can’t imaging what a cigar would do to your throat and tongue after you got about half way through? Then again this is coming from a non-smokers perspective and as a result I am purely speculative. Actually, because we had such big and robust wines with lots of upfront fruit, oak, etc the wines held up pretty well. I don’t smoke cigarettes but do enjoy a good cigar. Funnily enough, the Hunters & Frankau guys were more focused on how the cigars’ flavours changed with the wine,instead of the flavours of the wine changing with the cigar. Thanks for stopping by.